Many products supplied by Bravo have the option of personalised labelling for your company or your customers. These options would include screen printing at the site of the product manufacturer, customised printed labels or products available in blank bottles for you to customise yourself. If you have any interested or questions in regards to personalised labelling, costs or minimum quantities, please let us know and we are happy to assist. Klager Plastik Industrial Grade Mini Sprayers come with several options (i.e. generic pre-printed bottles, custom printed bottles and blank bottles) in either natural or white to attach your own labels. 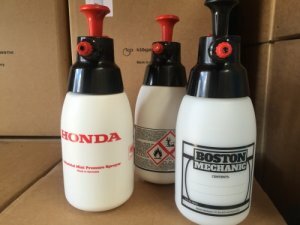 Some customers who wish to promote their own brand are regularly ordering sprayers with custom printed bottles. Klager’s cutting edge screen printing facility is capable of elaborately printing custom design/artwork up to 5 colours on mini sprayer bottles. Bravo, the the sole importer/distributor of Klager Plastik (Germany) in Australia & New Zealand, offers this great option to any customers who wish to order Klager’s sprayers in bulk with their own custom labelling. Please feel free to contact us should you be interested to have your own custom labelling printed on the mini sprayers or if you have any questions regarding costs, minimum order quantity, etc. We would be more than happy to assist you.